Of the ones listed, my favorite (other than caffeine, of course) would have to be CoffeeSpot by Sadish Bala. 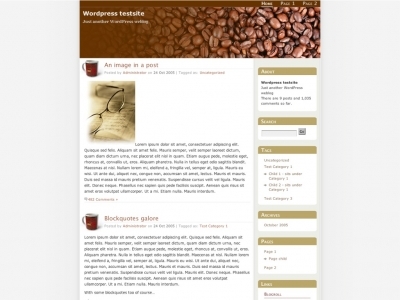 Check out the other coffee themes at WordPress Themes. Green Mountain Coffee Roaster is a New England icon. Their coffee is served in everything from restaurant to gas station here in New England. Founded in 1981, today Green Mountain is the nationâ€™s largest seller of double-certified Fair Trade organic coffee. Recently I had the opportunity to try two of Green Mountain’s Fair Trade Organic offerings. Green Mountain’s Organic Sumatran Reserve is an appealing coffee with an earthy richness you could expect of an organic coffee from the beverage’s birthplace. This is a pleasant, medium bodied coffee which, while it doesn’t disappoint in the cup somehow left me wanting more. A decent floral nose is the highlight of this coffee and, though the flavor is somewhat earthy the aftertaste is clean and smooth. 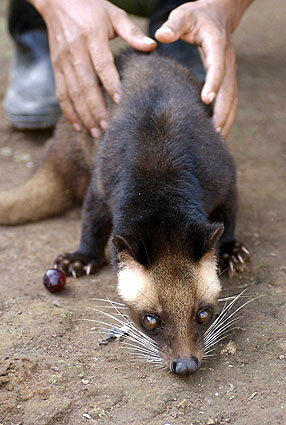 The roaster’s PBS Blend is a Mexican coffee with an interesting story (see their site for details.) I found this coffee rather disappointing. While the coffee was smooth with very little acid and no bitterness it also lacked any defining flavor. A hint of caramel was all I could discern from what was otherwise a surprisingly ordinary cup of coffee. Green Mountain Coffee Roasters has a large catalog of coffees. Through the gourmet coffee revolution they have become ubiquitous in New England and, while I was not impressed with the PBS Blend, the Organic Sumatran Reserve is a good coffee for those shopping for a Fair Trade organic coffee. Unfortunately Green Mountain has adopted the all too common industry trend of cutting back their bag size. Currently their coffees are offered in 10oz bags, both of these being between $7 and $8 per bag on their website. This equates to around $12/lb which, while not unreasonable, is a premium price for coffee. Part of this is undoubtedly due to the coffee being Fair Trade, the end result of which is the farmer seeing more of this money. Conclusions: Despite the premium price, those looking for a good organic coffee should enjoy the Organic Sumatran Reserve but a lack of richness or any defining flavor left me disappointed with the PBS blend.